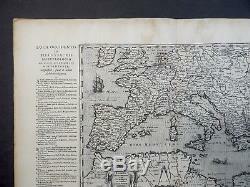 Rare (published only in one Parergon's edition) Ortelius copper engraved map of from the first historical atlas. A very fine copper engraved map that covers most of Europe, the western Mediterranean Sea and the adjacent African coast by Frans van Haren (was a theologian, historian, globe maker and mapmaker from around 1615 to 1624). 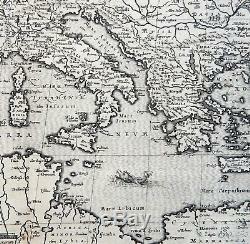 Van Haren prepared this map centered on the Mediterranean Sea for Ortelius classical atlas that described the world known to the ancients. The map is surrounded with columns of text with an alphabetical listing of place names occurring in the bible and other holy writings. Embellished by vessel, sea monster, compass and nice cartouche. 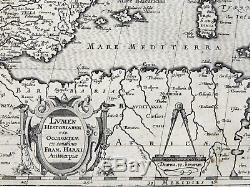 From the 1624 final edition by Balthasar Moretus of the first historical atlas ever published. Orteliuss Parergon began as a companion to his Theatrum but eventually it became an independent work. 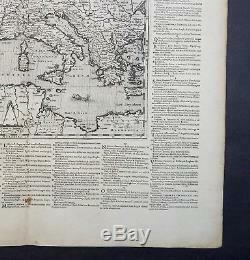 In fact, this collection of maps of the ancient world was so significant that it became the model for all historical atlases published throughout the seventeenth century. 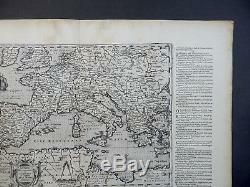 The maps and plates in the Parergon have to be evaluated as the most outstanding engravings depicting the wide-spread interest in classical geography in the 16th century (Koeman). Unlike the Theatrum, which consisted of existing maps reengraved by Ortelius, the maps in the Parergon were drawn by Ortelius himself. As a scholar of antiquity, a dealer in antiques, and a visitor to ancient sites, he was well prepared to execute the maps and all the maps from the Parergon reflect his passion for the ancient world. 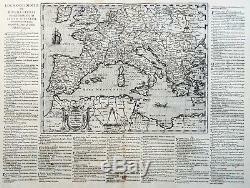 The map was printed only in 300 copies - cfr. Dimensions of the map with the text around: 37 x 49 cm (on sheet: 46,5 x 57 cm). Condition: Stable paper and good margins. 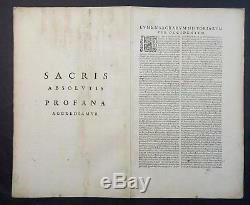 Some stains in the upper margin and on verso. Light age toning and some little spots. 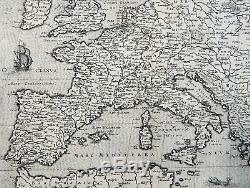 All of the maps we sell are Originals, Authentic and in Good condition. 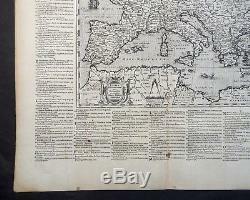 The item "1624 Europe Middle East North Africa F. Van Haren Ortelius Original Antique map" is in sale since Wednesday, April 04, 2018. 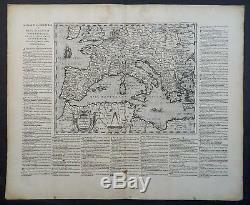 This item is in the category "Antiques\Maps, Atlases & Globes\Europe Maps".